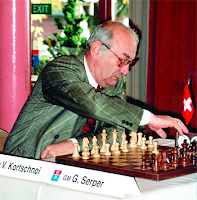 Korchnoi is a four times USSR chess champion (1960, 1962-63, 1964-65, 1970), two times winner of the interzonal tournaments for world championship, winner of two Candidates Tournaments (1977, 1980) and five time European champion. Victor Korchnoi played three matches with Anatoly Karpov for the World Chess Championship (two official matches in 1978 and 1981, and the 1974 Candidates' Final which later won Karpov the title by forfeit against Bobby Fischer). He also became a six time Chess Olympiad winner as a member of the Soviet team. The Anti-Queen's Indian System, which seeks to control the d5 square. 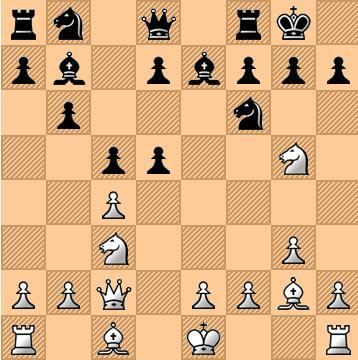 Part of the Anti-Queen's Indian System, the move threatens mate at h7 while attacking the d5 pawn. If 10. cxd5 then Black drives the White Queen away by 10....Nd4. The text allows White to maintain pressure. Black eliminates the threat, but White maintains pressure at the center. White maintains the pin on the b7 Bishop. Of course not 13....Kxh7 because of 14. Qh6+ Kg8; 15. Qxg6+... with a devastating attack. Black hoped for 18. cxd5 Nf3 double check! But Korchnoi saw the plan. Without the Queen, Black has already lost the game. The succeeding moves have become irrelevant.